October’s government shutdown locked us out of our national parks. Fortunately, national forests are nearly impossible to fence in. Forest rangers closed visitor centers, but they could not padlock our public lands. The indifference, lack of connection, and abstract selfishness of a political minority – disregarding communities beyond their voting district – blocked passage of a federal budget, keeping government workers from their jobs – in this case stewardship of our natural resources – and held our country hostage, reeking havoc with local economies, such as businesses dependent on tourists to our national parks. Flouting our temerity, we voted with our feet gaining access to our birthright, our public lands. Entering Inyo National Forest, we found welcome amongst the wilderness of trees in the Eastern Sierra and Great Basin Desert, trees, blessed by their ignorance of Washington, D.C.’s theater of the absurd. 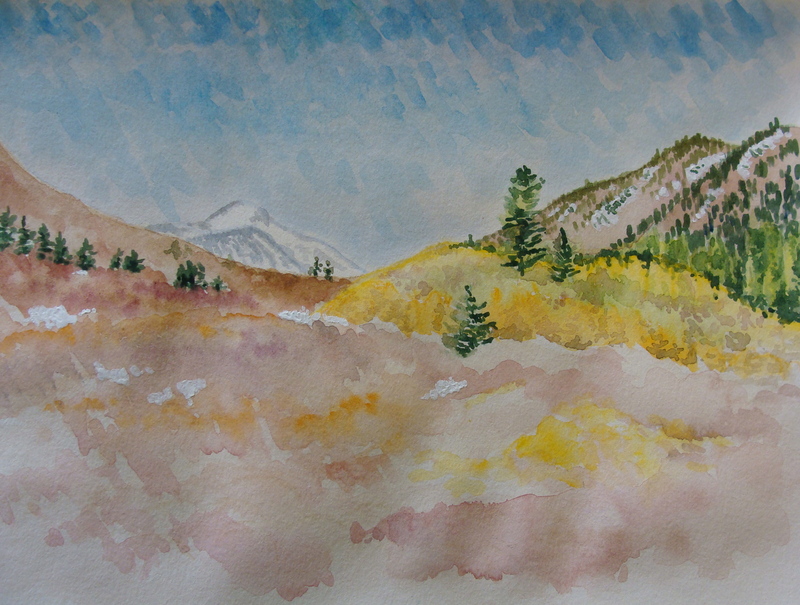 I photographed our journey in addition to the watercolors in this blog entry. When its fall in the Eastern Sierra, trees dress in dramatic and painterly yellows and gold accented now and then with a touch of red and orange. Near sagebrush scrub in the yellow pine belt bioregion found at approximately 7,000 feet above the sea, the yellowing leaves of black cottonwoods are jewel-like on the landscape. Thriving on moisture, the cottonwoods grow where their roots find water near lakes, meadows, springs, and mountain streams. Higher in the Sierras, in the 9,000 – 11,000 foot elevation range, forests of jeffrey and lodgepole pines, red fir and western junipers are found, as well as stretches of quaking aspens, simply breathtaking to behold. Finding water amongst rocks at cliff bases, these trees sparkle in the sunlight, and the wind reveals their white trunks and stirs leaves in a continual flutter. 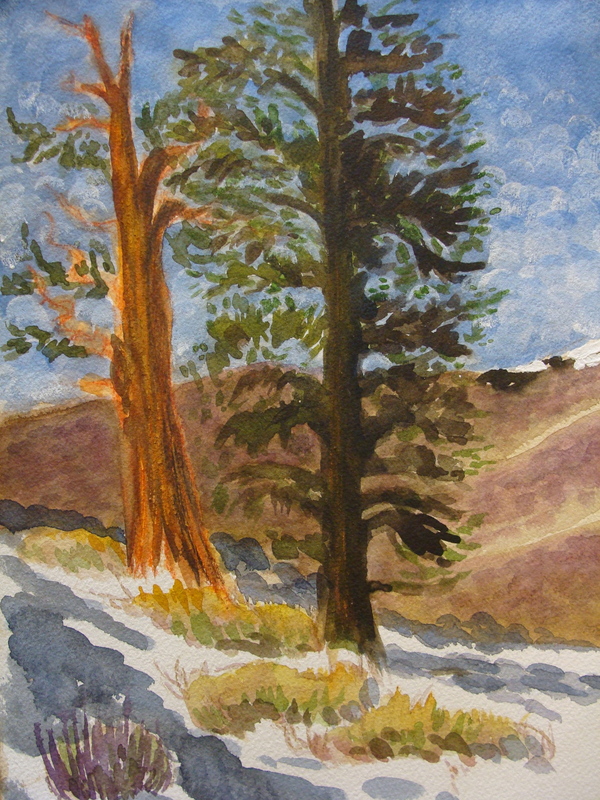 Farther East in the Great Basin Desert, the White Mountains host magnificent ancient bristlecone pine forests. Methuselah, the oldest tree on earth, estimated at over 4,750 years in age, thrives in this arid, exposed landscape, requiring minimal water and finding just enough nutrients in the dolomitic and alkaline soils where few other trees can flourish. Keeping only essential parts alive during times of stress, the living tree is dressed in dead branches, made smooth over time by the forces of wind, ice and fire. The sculptural bristlecone pines seem to form a community of dancers moving nominally in a minimalist ballet for the ages. The beauty is sublime; this place opens our living souls and we are filled with affection. In Song of Myself a poem from Leaves of Grass, Walt Whitman penned the line “the press of my foot to the earth springs a hundred affections.” May our political leaders in Washington remember their actions impact places and persons across our nation and the world. As they do their work, may they walk with affection, understand their commitments, and not trample – drunk with power – the places and communities – in the lands just beyond their own.